Just a little note. When we originally did this interview, we were under the impression that Alferian’s book “Wandlore” would not be available until the beginning of July. However if you head on over to Amazon.com you’ll see it’s available now! 1. Readers may not know this, but you were the very first interview done for The Magical Buffet. You were “10 Questions with a Druid“. Why on earth did you agree to do that interview? Why not? It was fun and I’m always interested in talking about druidry. I’m here to challenge you again and put your Bardic work to the test by asking for a second verse. Are you up to the task? 3. In 2006 we also talked about the Avalon School for Druidic Studies. I was so enthusiastic about it and sad to discover the website for it is gone. Can you share with me and my readers what happened with it? The board of governors and I closed it down mainly because I did not feel I had the time or skills to keep on herding cats. As many people have said, it was an idea ahead of its time. What is needed, as I’ve always said, is a physical location. Sort of, if you build it they will come. Some of those involved in the project thought online learning would draw students, but at the present moment druids are spread rather thinly and most of them haven’t any money. My thought was to present druidic ideas in a formal way, but entirely open, so you did not need to belong to an order to study it. No “secrets.” But you do need money, competent administrative staff, and time to draw students. There are a number of other folks out there running magical schools of one sort or another, and I really have respect for them. Last year I tried teaching at the Grey School of Wizardry and was very impressed with the administration and the teachers. I enjoyed the students too, and was sorry to leave, but I need to focus my energies on my writing. 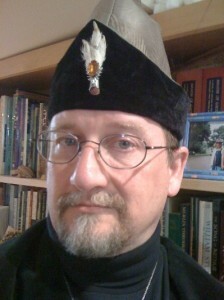 In fact, what happened after I closed Avalon Center was that I began writing a novel that is set at a druid university. It starts as a “school days” novel, as so many have, and follows the heroine as she grows up. It is meant to be a series. Although it is somewhat the same idea as the “Harry Potter” books, it is not intended to be a fantasy about magic. Rather, it is intended to present real magic as the subject of study in the schools. This gives me a chance to develop my idea of a magical school, without the hard work of manifesting using real people. Much easier if you can just create the people you need. The first novel in the series is titled “Emily Glass and the Alchemist’s Secret” and it is a bit steampunk, though not dystopian, nor set in Victorian England. I won’t say any more. You will just have to read it. 4. Enough about the past, you’ve got a wonderful book, “Wandlore: The Art of Crafting the Ultimate Magical Tool”, that is coming out in July! Let’s first talk about how you started making wands? It was 1998 or so that I made my first wand, when I was studying in the Ovate grade of OBOD (the Order of Bards, Ovates, and Druids). The grade work includes a good deal of work with the trees and ogham signary, so I was talking to a lot of trees. The oghams are a system of signs used by the Irish bards of old. Among other things, each signifies a different tree. I’ve always talked to trees so far as I can remember but in this case I was getting to know the character of each type of tree in a more methodical way. An oak dryad is different from an elm dryad, and both of those are very different from a poplar or birch. So, the study of the old bardic lore of the trees and their correspondences quite naturally led me to my calling as a Wandmaker. It definitely was a calling too. My spiritual guides told me that part of my purpose was to reintroduce the art of wandmaking into the present magical culture. That along with my fiction writing is what I feel called to do with my life – principally. Obviously there is a lot else. Steampunk for instance. 5. And then how did the book “Wandlore” come about? I accumulated a lot of the lore on my website – the Bardwood Wandry – and at some point a druid friend of mine told me that I really should write a book on the subject. After about five years, here it is. Writing “Wandlore” helped me to articulate a lot of the ideas I have had over the years – things that I accepted intuitively and had never tried to explain to others. The elemental structure of the four principal parts of a wand for example. Those parts are, the point, the shaft, the handle, and the pommel. They correspond respectively to fire, air, earth, and water. Why? Well, let me tell you why. The pommel which is often set with a stone or a large rounded shape, is used as the reservoir of spiritual energy or prana within the wand. It is elementally water and yin, while the point is the opposite – fire, the energy of will, and yang. The handle which contacts the wizard’s hand is earth because it draws on the immediate physical and material control of the user. The shaft is air due to its role as the conducting medium of prana. Magic is cast through the air, as it were, both in the literal sense of material air uniting and connecting all things on earth, and in a psychological sense in which it is the thoughts of the wizard that conduct the will, the non-verbal power of desire. 6. The amount of detail and just raw piles of information in the book is staggering. How long did it take to do all the research? Several lifetimes. I drew upon the work of many others, as you probably noticed if you read the bibliography. The book collects a lot of information that has been scattered around in magical circles for a generation or more. Everything from tree lore, to stone lore, and the mysteries of magical beasts. One of the techniques I adopted from the famous Mr. Nitrogenous P. Ollivander is the use of magical cores in my wands. I had to do a lot of research on that subject with my Elven sources. I have three Elvish friends who very kindly made their own knowledge available to me. Some of it was general knowledge of how magic works, and some was particular lore about wands. They advise me in all my magical work, and confirmed that the use of spiritual inclusions from astral beasts was a long-established practice, not just the stuff of fiction. Anyway, magical cores. The use of phoenix feather, unicorn hair, griffin feather, etc. etc. has a perfectly good basis in real magic, quite apart from the “Harry Potter” books. In the fictional world of J. K. Rowling, one is led to believe that the wand’s magic comes from the unicorn hair or phoenix feather. This is only partly true. The magic in a magic wand comes from the mage using it. It does not bestow magical power on the wizard, as seems to be the case to some extent in the Harry Potter books. But the inclusion of bodily ephemera of mythical beasts adds their character to the wand. A wand of wood with an animal core and a stone reservoir in the pommel unites all three of the major kingdoms: animal, vegetable, and mineral. The parts used, however, are a bit off in the fictional world of Ms. Rowling. She, for example, has Ollivander using “dragon’s heartstrings” which is a horrible idea. If there is one thing you must not do when taking body parts from a magical animal it is to kill it or dissect it. Heart muscle, which I presume is what she means, would be nothing but trouble. That’s the sort of thing you would use to create a cursed object. It is the scales of the dragon that are used in wands. Dragons shed their skin like snakes and the scales can be harvested by a wandmaker or general apothecary of magical ingredients. I know a very nice shop in the netherworld where I get mine. Saves a lot of time. The aspects of druidry that enter into my practice, in the process of enchantment and in the work with tree spirits (dryads) come from the Order of Bards, Ovates, and Druids and my studies within the order. Druidry forms the framework of my magical practices, and I have also adopted a few ideas and ritual forms from the Hermetic tradition. So, there was some original research and there was a lot of comparing of older sources and testing them. The actual writing of the book took about four years I think, including the better part of a year to revise the whole thing after Elysia Gallo, the Llewellyn editor and her colleagues gave me feedback. I’m very grateful for that help because it is really the editor that makes a good book a great book. 7. 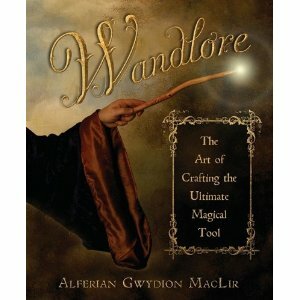 Now that your book “Wandlore” is about to release, have you been flooded with requests from people looking to have you craft a wand for them? Ha! Ha! Ha! No. I doubt if anyone who has seen the book on offer knows about my website. They would have to search for my name I think. I’ve put the web address of Bardwood.com in the book, so when people actually come to read it, the word might get out. Bardwood Wandry is, at present, just me. I would like to engage an apprentice or two, but I’ve been too busy to advertise. My clients have to be very patient. It usually takes me months to turn an order around. I always have something in the works. I’ve been making a fire staff from one of my druid brothers just lately and the dental work on the dragon head at the top is taking far, far longer than I ever imagined it would. Teeth. Teeth! 8. Um, ahem (cough), err, um….any chance you would craft me a magical wand? Why not? All you need to do is go to the web shop and come up with a design you like. You can choose from the ones in the photos there, or you can come up with your own design in consultation with me. Bespoke wands are my specialty. 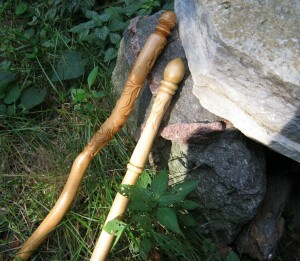 I’ve priced them in three ranges – pocket wands, regular length wands, and extra long wands. There is an additional charge for making them “fancy” which means elaborate carving, animals, goddesses etc. I will generally throw in a few leaves and spirals and an inscription without counting it as fancy. And I do make staves, but that’s a different story. Much more laborious than a wand, and as such, considerably more expensive. 9. So what do you say, want to do another interview 5 years from now? Absolutely. You don’t need to wait that long! Perhaps when “Emily Glass” comes out we can do it again. Okay, tell me what you would like in a wand: wood, length, core, stone (if any), carving, symbols, inscription. Design your own wand! I definitely like the more “traditional” (and by my air quoted traditional, I mean as portrayed in popular culture) style wands. So, a standard size and straight. Since I don’t have a magical practice, I don’t know after that! Relatively simple with perhaps some carving along and around it. Not being very magical myself, I generally leave magical intuition to the crafts people who make things for me. Thus far, they’ve done better at it than if I suggested something myself! Dr. Alferian Gwydion MacLir was born in a zeppelin over the south of France in 1830 — in his most recent incarnation that is. Like most time lords, he tends to change his appearance from time to time. Living with one foot in the Netherworld, Dr. MacLir sometimes forgets where or when he is and is chronically absentminded and distracted. He cannot abide doing nothing but always has to be creating something. Even when reading for pleasure, he is taking mental notes for his books. He has been a wand maker for eleven centuries and a Druid since about the 3rd century B.C.E. He is a card-carrying member of the Order of Bards, Ovates, and Druids (OBOD) a traditional British Druid order. He might be a Freemason, but if he were, he wouldn’t tell you because it’s a secret. He might also be a secret agent but there again, you wouldn’t know. Presently he lives, writes, makes wands, and builds steampunk mods at his home, Bardwood Lodge, a small and hardly noticeable place in the Lake District of Terre des Lacs in the northern oak savannahs of upper-middle North America — approximately 44.92° N Latitude and 93.3° W Longitude. He has a lovable cat named Minerva and a large collection of extraordinary hats. The doctor travels often and spends the Winters at the MacLir family castle Llyranwyddllyneth in Gorias, mainly because it is always summer there. Certainly not for the plumbing. When he doesn’t have his nose in a book or his clothes covered in wood chips, he is probably at a cafe writing, girl-watching, or asleep in his hammock.